SwagSam, Founder, of the podcast network WhatUp Silicon Valley just published his first book! In the hustle that is Silicon Valley, we are all looking for an edge. We look at the latest trends and will try anything (within reason of course) to give ourselves a competitive edge. Always looking to increase productivity, increase bottom line … and in Silicon Valley to increase company culture! If you can relate to this feeling that there just aren’t enough hours in a day then and want to reduce stress in your life; then SwagSam’s book “Success With Swag(ger)” is for you. 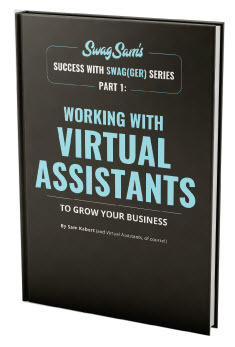 In this book, SwagSam outlines just how he and his team at WhatUp Silicon Valley have used virtual assistants (VA’s) to grow each of their respective businesses. It’s an actionable step-by-step guide to identifying what tasks that are wasting your time and guides you to hiring your first VA! You can grab check out the book on Amazon by searching “SwagSam” or just clicking the link here. WhatUp Silicon Valley is the podcast network on what’s trending in the South Bay for and by young professionals that live the Silicon Valley hustle. Business Insider also said SF is high tech capital of the world.